Learning about best management practices, conservation easements, native and invasive plants, presecribed fire, and nuisance wildlife will help you protect your land for the use and enjoyment of future generations. Best Management Practices (BMPs) Overview: a site produced by the University of Florida IFAS Extension that provides information on the need for BMPs, their implementation, and available manuals. Florida Forest Service Forest Health Unit: this unit provides information on assessing the condition of a forest stand relative to its age, structure, composition, function, vigor, resilience to disturbance, and presence of insects and invasive species. Agricultural Best Management Practices (BMPs): a series of technical manuals and other documents detailing BMPs for the protection of the State's water resources in association with agricultural activities. Forest Health Extension: a website produced by the University of Florida School of Forest Resources and Conservation designed to share findings of the Forest Pathology lab and information on managing forest health issues across the state. The Southern Fire Exchange (SFE): a regional fire science delivery program, representing the southeastern United States. Introduction to Prescribed Fire in Southern Ecosystems: Information needed to help landowners and managers become technically proficient in the proper use of prescribed fire. Silviculture Best Management Practices (BMPs): a source of specialized information on BMPs that protect the State's water resources in association with silviculture activities. Florida Forestry Wildlife Best Management Practices for State Imperiled Species (WBMPs): WBMPs enhance silviculture's contribution to the conservation and management of freshwater aquatic and upland wildlife in the state. This manual provides guidance to landowners and others who choose to implement these important practices. Florida Forest Service - Prescribed Fire: a source of information on the use of prescribed fire in Florida, including rules and regulations, online burning tools, and training options. 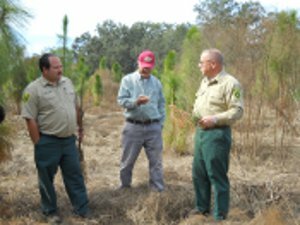 Florida Forest Stewardship Program - Conservation Easements: a conservation easement is a voluntary, legally binding agreement between a landowner and a government or nongovernment conservation organization that keeps land in agricultural and/or open space uses. The agreement is customized to meet the landowner's objectives and, in most cases, is perpetual. University of Florida Electronic Data Information Source - Prescribed Fire Publications: a list of pulications produced by UF/IFAS Extension detailing the use and benefits of prescribed fire, as well as the regulations governing its use. Property Tax Exception for Conservation : guidelines and procedures for the Implementation of a HB7157 Property Tax Exemption for Real Property Used for Conservation Purposes. The Florida Association of Native Nurseries: provides information on Florida's native plant communities, growing and planting Florida native plants, and a list of native nurseries in the state. Agricultural Conservation Easement Program: The Agricultural Conservation Easement Program, through the USDA Natural Resources Conservation Service, provides financial and technical assistance to help conserve agricultural lands and wetlands and their related benefits. There are two components to this program: Agricultural Land Easements and Wetland Reserve Easements. The Florida Native Plant Society: promotes the preservation, conservation, and restoration of Florida's native plants and plant communities. Land Trust Alliance: promotes voluntary private land conservation to benefit communities and natural systems and keeps a current listing of land trusts in each state. Groundcover Restoration in the Forests of the Southeast: a manual with information on planning and implementing a groundcover restoration project produced by Conserved Forest Ecosystems: Outreach and Research (CFEOR), a cooperative of public and private organizations and members of the public. Bureau of Entomology, Nematology, and Plant Pathology- Botany Section: a source of noxious weed Information from the Florida Department of Agriculture and Consumer Services Division of Plant Industry. Florida Wildflower Cooperative: a cooperative run by seed producers across the state that produces and sells seed for native Florida groundcover restoration and home landscaping projects. Florida Invasive Species Partnership: a collaboration of federal, state, and local agencies, non-government organizations, and members of the public with a stake in managing invasive species in Florida. Ernst Conservation Seeds: a seed producer and seller specializing in native and naturalized seeds and plant material of Eastern North American ecotypes. Extension Weed Science: a University of Florida IFAS Extension website providing recommendations for managing and controlling weeds, tips for using adjuvants and sprayers, and instructional presentations on weed identification, weed control, herbicide chemistry, and herbicide resistance. Florida Exotic Pest Plant Council: an organization providing support for the management of invasive exotic plants in Florida's natural areas by providing a forum for the exchange of scientific, educational, and technical information. Archbold Biological Station: a website for the research station on the Lake Wales Ridge with information on exotic species found in the region and their control.